The Bralo BM-164 is a very strong lever tool, designed for professional use both in and outdoors. It is the right tool for those applications that require large rivets with a greater resistance. The main body is manufactured in a high density aluminium casting. 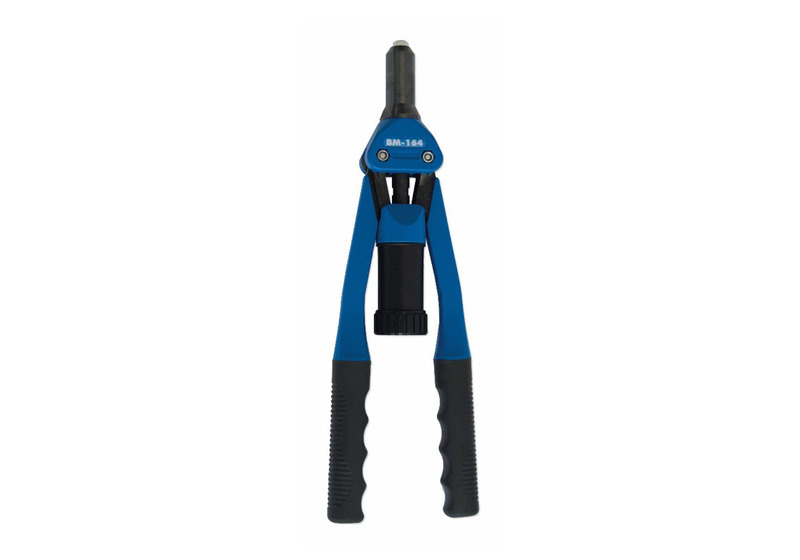 The levers and the anchoring are made of the highest quality steel, providing the tool with a greater resistance. For use both in and outdoors. Riveting capacity of up to 6.4 mm, 6,5 mm Structural rivets und 7,7 S-trebol rivets. Provided with a mandrel collector that contributes to the cleanliness and safety of the working area. Provided with a cavity to hold the additional nose pieces. Application field: Up to 6,5 structural and 7,5 S-Trebol. The Bralo BM-164 riveting tool is available packed in a protective box and plastic case.